Watch: Diaspora Affairs Ministry, US Heritage Commission work together to preserve sites, artifacts damaged during Nazi and communist rule. 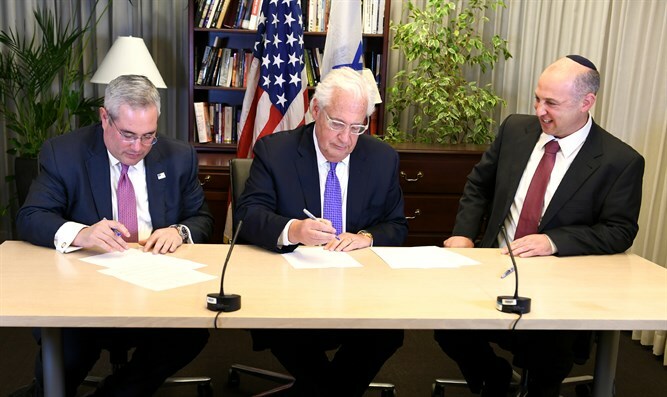 The US Embassy and Ambassador David Friedman welcomed the signing of a Joint Declaration of Cooperation Between the United States Commission for the Preservation of America’s Heritage Abroad (CPAHA) and the Israeli Ministry of Diaspora Affairs on the preservation of certain cultural properties. Under the declaration of cooperation, the CPAHA and Ministry of Diaspora Affairs agreed to work together to preserve the cultural heritage of their citizens in Europe, including cemeteries, monuments, and archival material, which were decimated by the Holocaust and decades of communist rule. The United States and Israel have committed to identifying damaged, deteriorated, or obscured sites and related objects of cultural heritage in Eastern and Central Europe, and to work together to preserve those sites through joint projects. Chairman Packer said that the agreement would not have been possible without the leadership of Ambassador Friedman.